Bottle gourd /lau is an unique vegetable. I was shocked when I found that Bottle gourd/ lau is originated from Africa not from Asia. But it is used widely in Bangladeshi cuisine. Here I am giving bottle Gourd with Prawn/ lau chingri of the easiest recipe which you never go wrong. In the list of ingredients you can see that I use sugar. Don’t get shocked about it. Sugar is used as a taste enhancer in Bangladesh and other countries. Hope you will like. 1. First peel the bottle gourd and cut into small pieces. 3. Heat the pan with oil on medium heat and add sliced onion and bay leaf. 4. Cook it till it becomes soft and add turmeric, chilli powder, 1 teaspoon salt and onion paste. 7. 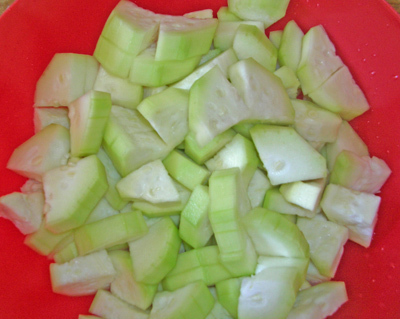 After 2 minute add 1 and ½ cups water or enough water to cook bottle Gourd / Lau and stir it. 9. Check the salt and add sugar and coriander leaves. 10. Stir again and turn off the heat. 11. 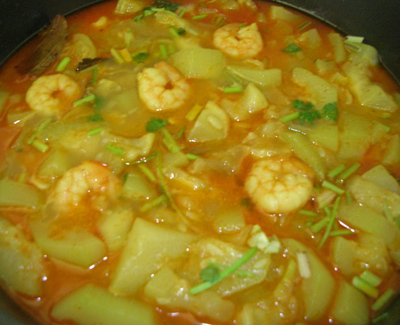 Serve bottle gourd with prawn/ lau chingri with rice. Tips : you can even fry prawn first and add with half cooked bottle gourd later. This is a different take on Lau chingri. We make ours dry with jeera phoron, green chili, jeera powder and salt and sugar. The lau is cut into thin long strips. I will try this one. Try my one and let me know. Thanks. Tried it and loved it! Highly recommend it.